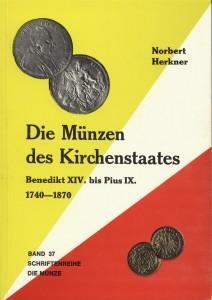 DIE MUNZEN DES KIRCHENSTAATES (1974 paperback, 184 pages, Berlin) by Norbert Herkner is a catalog of papal coins from Benedict XIV to Pius IX (1740-1870). Each coin is pictured in black-and-white. Includes valuations. Catalogs dedicated solely to papal coins are few and far between!